Damn it, people, can’t Quentin Tarantino have one thing go right lately? First, his personal patron Harvey Weinstein gets rightly brought down for his abhorrent treatment of women (with the director admitting he “knew enough” about Weinstein’s behavior to do more than he did); then, Tarantino himself comes under fire for his on-set treatment of Uma Thurman, his friend and frequent star. Now, it turns out he can’t even release his Charles Manson movie on the anniversary of Manson’s most famous killing spree. When’s this guy going to get a break? 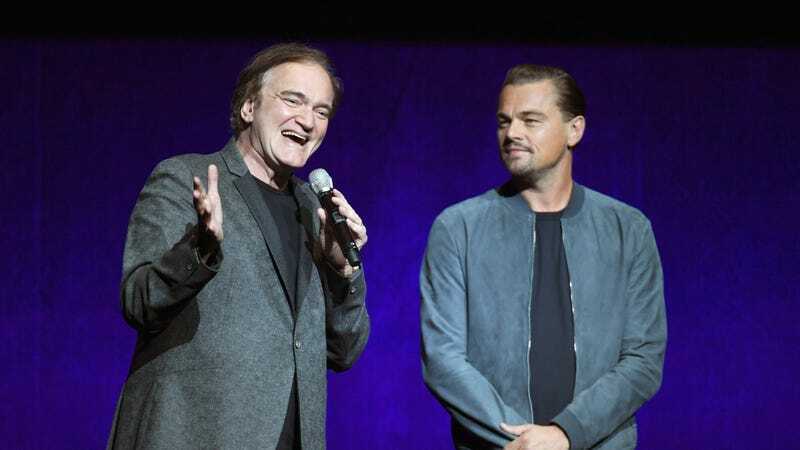 Of course, Tarantino has been emphasizing for a while now that his latest feature, Once Upon A Time In Hollywood, isn’t a Manson movie per se, even though it takes place during the time of the Tate-LaBianca murders, and features Margot Robbie as Sharon Tate herself. (Dakota Fanning’s playing Squeaky Fromme.) Rather, he’s intending to use the murders simply as a backdrop for Brad Pitt and Leonardo DiCaprio’s slacker-actor action, which is presumably why its opening was scheduled for August 9, 2019—the 50th anniversary of the night Tate died. But no more; although the studio didn’t state its reasons, Sony has now moved the film’s release up two weeks, to July 26, 2019. It’s not clear if that’s part of some larger schedule shuffling, or just an effort to calm Tate’s family, who’ve already expressed their discontent with Tarantino’s film. Either way, we’re getting a new Tarantino movie a bit earlier than we otherwise would, so please temper your excitement/supply of eye rolls/sense of guarded appreciation accordingly.